Do you have unsightly cracks and potholes in your asphalt? If damaged asphalt remains untreated, it can often lead to larger issues, significantly driving up the cost of your pavement investment. Although asphalt is one of the most durable pavements, it does start to deteriorate over time. The harsh weather conditions of the Peoria area are one of the more common contributing factors. Rain, extreme temperatures, and even some chemicals, can lead to the breakdown of the pavement surface. Proper maintenance techniques such as sealcoating can greatly extend the life of your pavement. As asphalt ages, and without proper maintenance, moisture will begin to penetrate the surface, leading to cracking and a breakdown of the base that lies underneath. 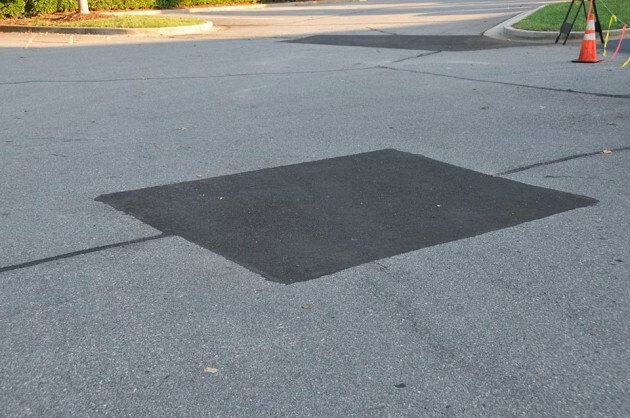 The sun and heat can also dry out the asphalt, leading to cracks due to the drying out of the liquid asphalt binder. Likewise, common vehicle chemicals such as gas and oil can speed up the deterioration process. Additionally, a failure in adhering to requirements during the construction phase can lead to an asphalt repair earlier than expected. Other factors that lead to premature deterioration include an improperly installed base layer below the asphalt that is either insufficient or improperly prepared. If the asphalt temperature is too low when installed it can also lead to deterioration in as little as 3 to 5 years. Working with a company who is familiar with the application of asphalt is essential in preventing deterioration. There are a few different types of deterioration which can affect asphalt, including cracking, distortion, and disintegration. A pothole repair can be completed in a rather short period of time and can be used with recycled and “green” materials. Whether you have noticed the beginnings of pavement cracking or have a large pothole, the technicians at Hoerr’s Blacktop & Sealcoating can help to fix your asphalt needs. With a toll free call to 309-222-2979, you will be put in touch with a skilled Hoerr’s employee who will be able to provide you with a free estimate today. Additionally, click here to contact us for a free quote. We are proud to serve the Peoria, Bloomington, and Galesburg areas with the best quality asphalt paving and maintenance work available on the market.